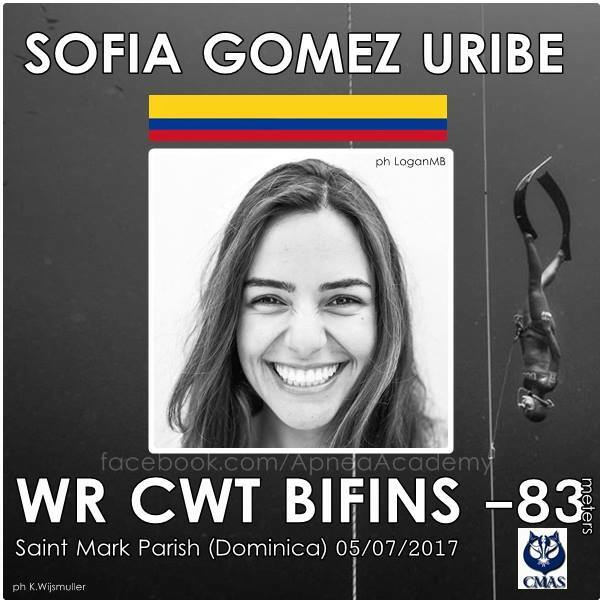 Colombian Freediver Sofía Gómez Uribe competed in the 23rd annual Dominica Dive Fest, hosted by the World Underwater Federation (CMAS). The Dominica Dive Fest is the longest running scuba dive and watersport festival in the Caribbean and she has set a new CMAS Freediving World Record of 83.1 metres in CWT Bi-Fins Apnea (Constant Weight). The Dominica Dive Fest was held between July 2-16, 2017, just 2 months before Hurricane Maria devastated the island of Dominica. 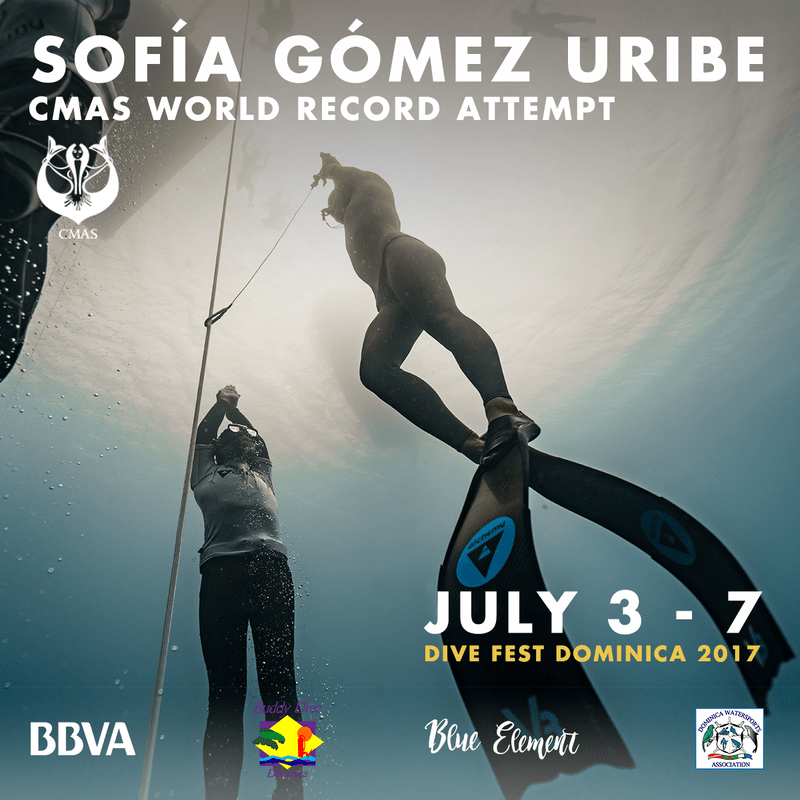 CMAS, in conjunction with Dominica Dive Fest presented a coveted world-record breaking opportunity for Sofía Gómez Uribe . 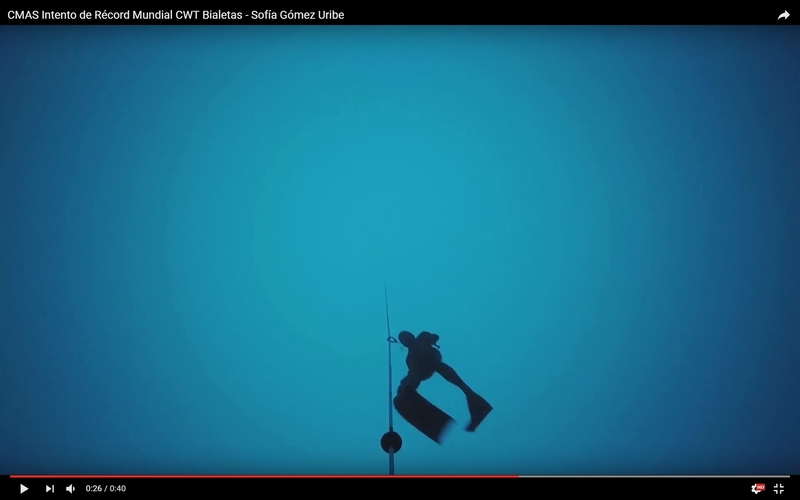 She broke the world record on July 5 by diving 83.1 metres in 2 minutes and 43 seconds in bi-fins, beating the world record of 82 meters held by Alenka Artnik from Slovenia which Artnik had achieved at the CMAS World Championship in Kaş Turkey in 2016. Sofía Gómez Uribe continues to represent Colombia in several national and international diving competitions. She had ranked #1 worldwide in three separate disciplines of freediving prior to making her world record in Dominica. Prior to Hurricane Maria’s landfall on September 18th, 2017, Dominica was one of the Caribbean’s most premiere diving locales, by virtue of its deep diving and translucent waters and its immaculate reefs. Dominica’s reputation as a diving location among the world diving community was pummeled to center stage with Sofia’s world record, however further tourism arising out of this has suffered a major setback due to the devastation to the island caused by Hurricane Maria of 2017. We hope that in due time, our island will continue to be instrumental in the future achievements of international freedivers.